EUR/USD is retreating from the highs it reached on Wednesday. All eyes are on the European Central Bank. EUR/USD is trading above 1.1350 but retreats from its previous attempts to break above 1.1400. The US Dollar is gaining a bit of ground across the board, but data from the old continent is not helping. French services Purchasing Managers’ Index disappointed by dropping from 49 to 47.5 points in the preliminary read for January, implying a contraction in the sector. It is significantly worse than 50.5 that was projected. Manufacturing PMI beat with 51.2 but it was not enough to allay fears that the euro zone’s second-largest economy is slowing down alongside its peers. In Germany, the Manufacturing PMI slipped below the 50-point threshold, to 49.9 but the Services PMI surprised to the upside with 53.1 points. All in all, the data are not that promising. The primary event of the day is the European Central Bank’s rate decision. The ECB ended its bond-buying scheme in December and maintained its pledge to hold rates at low levels through the end of the summer, implying a rate hike in September. However, recent economic indicators are clearly pointing to a slowdown. The Frankfurt-based institution is not expected to make any policy announcements, but President Mario Draghi will have to acknowledge the slowdown in some form or another. In previous public appearances, he remained somewhat optimistic, especially on the employment situation and rising wages. How far will he go this time? In the US, the government shutdown continues as Republicans and Democrats are not getting closer to a resolution. The White House is reportedly preparing for the debacle to continue through the first quarter. House Speaker Nancy Pelosi canceled President Donald Trump’s State of the Union address that was due on Tuesday due to shut down. The economic damage is growing by the day. Trade talks with China are not making any progress but both sides denied that some of these negotiations were canceled. 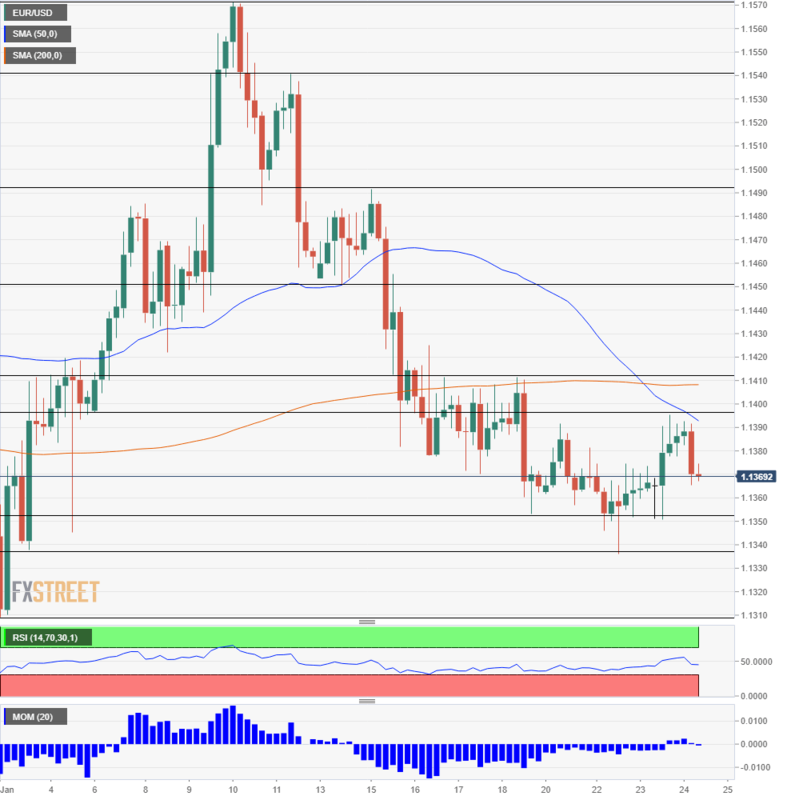 EUR/USD is trading below the 50 and 200 Simple Moving Averages on the four-hour chart, with the 50 crossing the 200 one to the downside, a bearish sign. However, Momentum and the Relative Strength Index are quite stable. The pair is battling 1.1355 which was a support line in recent days. The fresh low of 1.340 follows closely. 1.1310 was the low point in early January. 1.1270 was a double bottom in December. 1.1395 capped the pair early in the day. 1.1410 was a stubborn cap last week. It is followed by 1.1450 that provided support in mid-January. 1.1490 was a peak around that time.